Having a bad hair day with flyaway, frizz and static? It's time to balance out your hair ions with the Portable Electric Ionic Hair Brush . Constant brushing and towel-drying can strip away negative ions from your hair and that's where our Amazing Ionic Hair Brush comes in handy . MUCH HEALTHIER: Every time you comb your hair, experience 12 million /cm3 anion curing, antistatic to eliminate frizz and lock water conditioner to avoid electrostatic and messy hair and help you regain top strength. Long-term use can reduce hair loss, relieve headaches and dizziness. 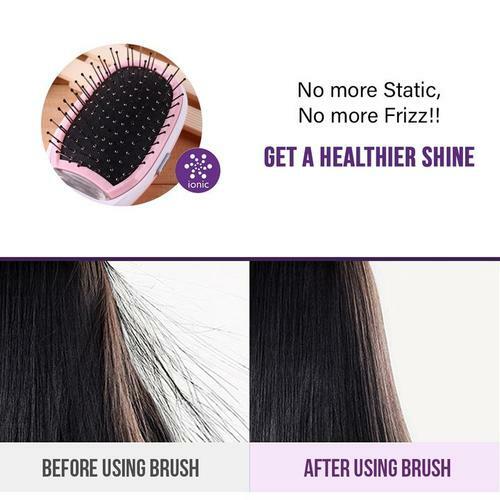 This Hairbrush emits negative ions into your hair to restore the balance of ions and makes your hair shiny, smooth, frizz-free, and manageable. It's time for some lustrous, sheen hair.